Wednesday September 16th 1896 I had a lot of baking to do. and the boys put up the sitting room stove. I did a lot of sweeping and cleaning during the day. Seth came out for dinner and Will took his truck to town in the afternoon as he is going home to stay. Mrs Hoffman and sister were here in the afternoon and Frank Stevens came to talk to Will. It has rained a little today. 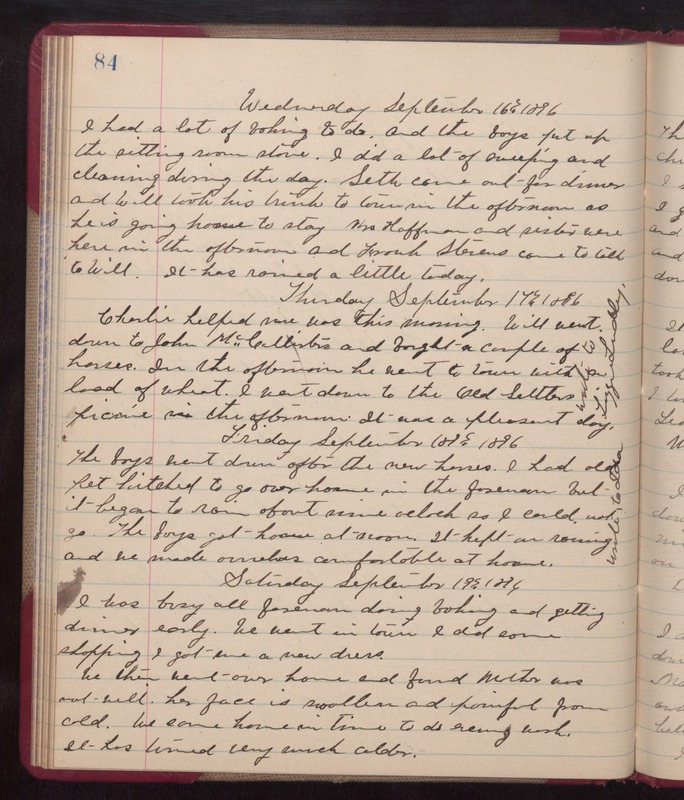 Thursday September 17th 1897 Charlie helped me wash this morning. Will went down to John McCallisters and bought a couple of horses. In the afternoon he went to town with a load of wheat. I went down to the Old Settlers picnic in the afternoon. It was a pleasant day. wrote to Lizzie Lindley Friday September 18th 1896 The boys went down after the new horses. I had "Old Pet" hitched to go over home in the forenoon but it began to rain about nine oclock so I could not go. The boys home at noon. It kept on raining and we made ourselves comfortable at home. Saturday 19th 1896 I was busy all forenoon doing baking and getting dinner early. We went in town I did some shopping. I got me a new dress. We then went over home and found Mother was not well. Her face is swollen and painful from cold. We came home in time to do evening work. It has turned very much colder.